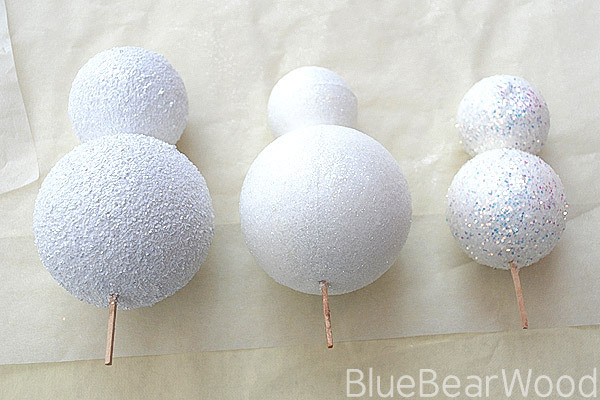 This sparkly snowman decoration is so cute. My girls make them to give to their teachers at the end of term but we also use them in Christmas wreaths the Christmas foliage over the fireplace and as stand alone decorations. They take a couple of days to complete so although younger children will need lots of support it can be ideal for those with a short attention span as they can easily stop and start. 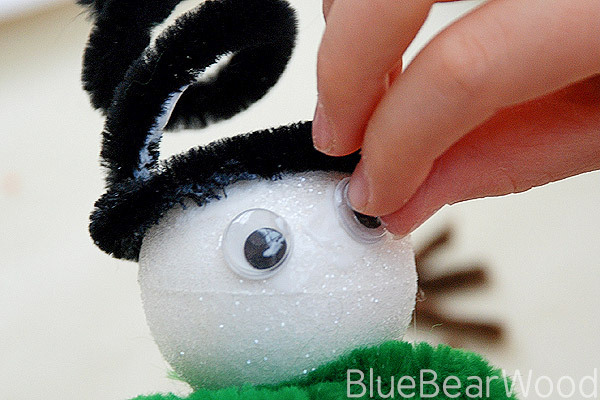 I tend to glue together the head a body in advance but you could also cover the snowman in glitter before hand so that younger children only add the decoration. 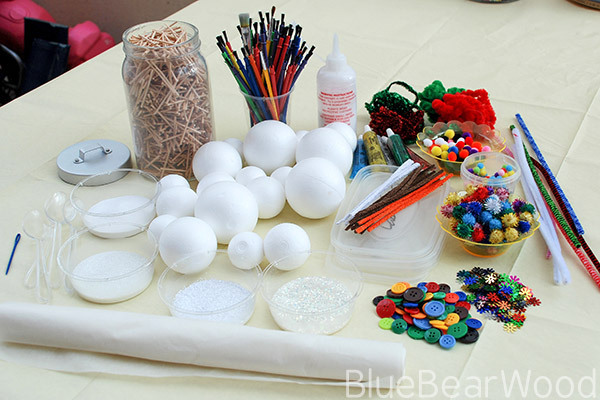 Polystyrene spheres, small wooden sticks, PVA glue, white glitter or sand, paintbrushes, pipe cleaners (I use traditional and chenille), decoration accessories such as googly eyes, glitter glue, sequins, buttons, small pom poms, chenille ribbon or tinsel wired ribbon. 1. 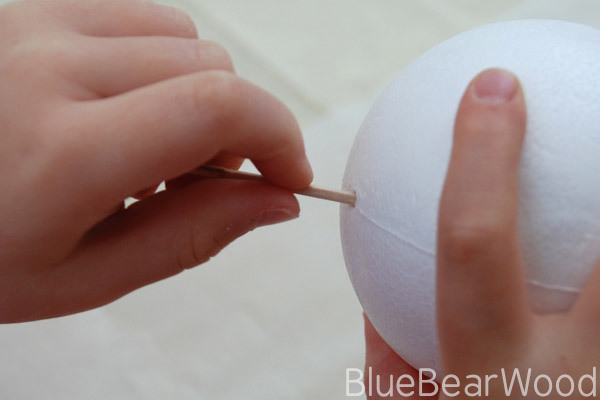 Snap a small matchstick in half and glue both pieces side by side into the top of the largest poly sphere leaving enough of the stick proud to push into the head (use a plastic needle to make holes for the sticks). Make two matching holes in the head, cover the sticks with glue and attach tt head. Leave over night to dry. 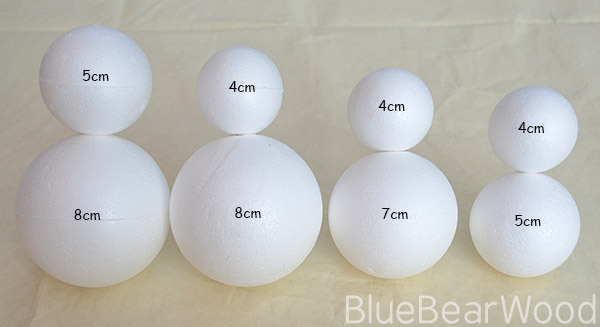 The photo below shows the sizes of polytyrene spheres I tend to put together. 2. 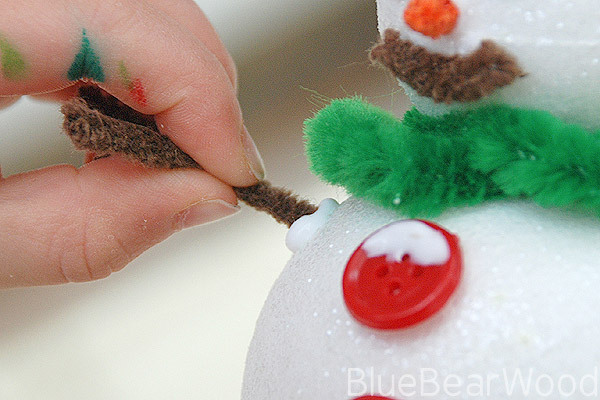 Push a match stick in the base to use as a handle and paint PVA glue carefully over the snowman making sure that there is a good even cover. If you leave the glue to thick it will run and leave marks a bit like gloss paint. I tend to have a quick look at the snow man after my girls have painted the glue on and will thin it out if necessary. 3. 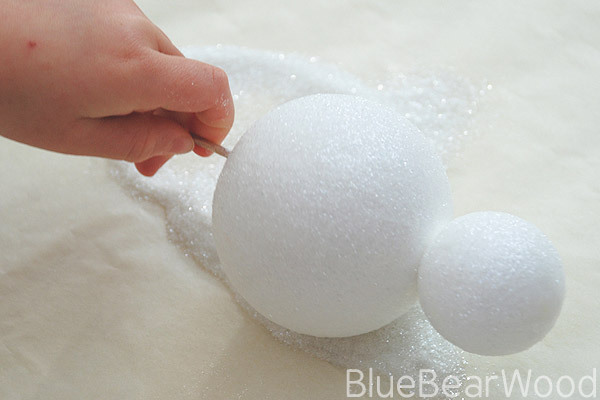 Sprinkle the snowman all over with glitter or white sand (25g of glitter or 50g of sand is plenty) I like to use a sheet of grease proof paper to catch the glitter on as I think it slides of more easily when tipping it back into the glitter container. I also like to get the girls to use a spoon to pour the glitter with as it gives them a little more control. 4. 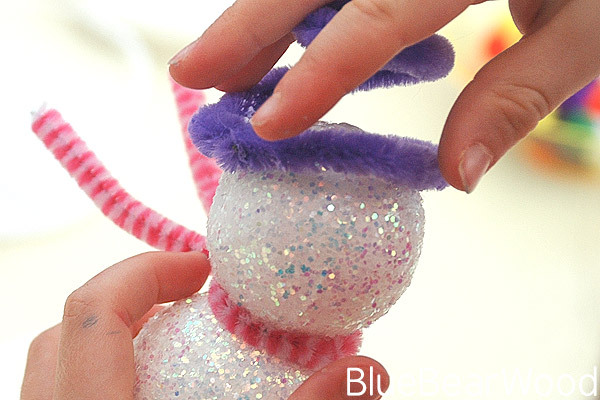 When all the glitter has been poured out of container roll the snowman around on top of the glitter that has accumulated on the paper below. This will make sure the snowman is completely covered. 5. Leave to dry over night preferably. The photo’s below going from left to right use white coarse PVC glitter, clear fine Polyester glitter and white iridescent glitter. White sand gives a similar texture to the middle one but without the shine. 6. Now to decorate but before you start carefully wiggle out the little wooden stick. Start with the scarf as that doesn’t need gluing. 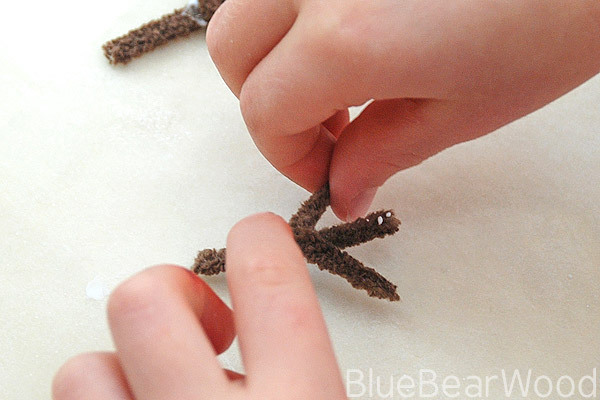 Chenille Ribbon makes a fantastic floppy scarf and pipe cleaners are great as you can bend them into shape. Thin strips of felt also look good. 8. Next glue eyes, a nose and mouth on. Small orange pom poms or a bit of traditional orange pipe cleaner make fantastic noses. 9. Make some arms. Again cotton pipe cleaners are great for this. 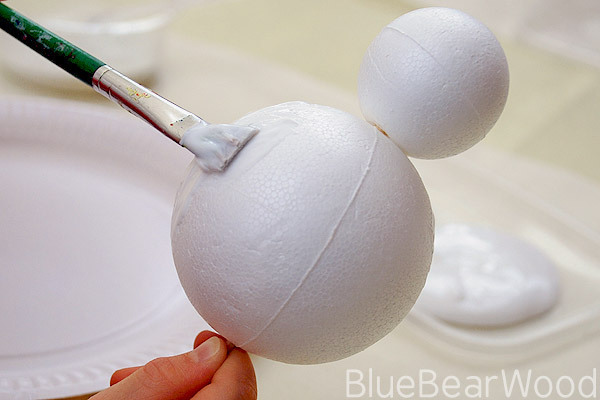 Use a plastic needle to make holes and glue arms in place. 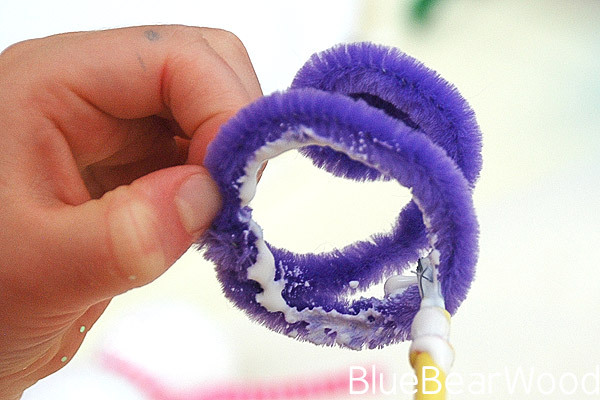 Make a ring out of a white pipe cleaner to stand them up. And there you have it. 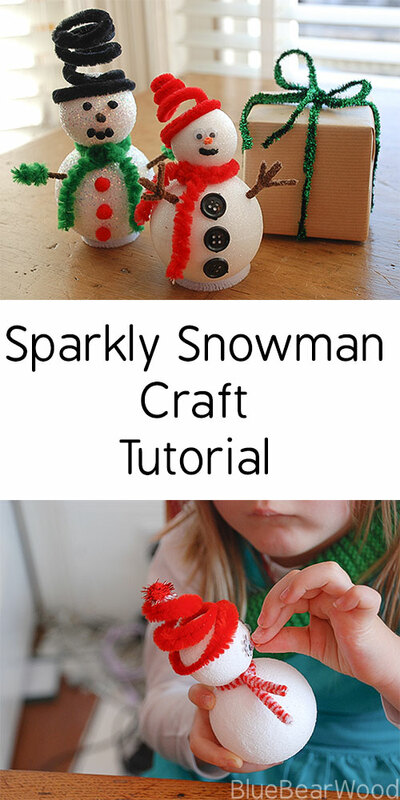 A gorgeous sparkly snowman to add to your decorations. 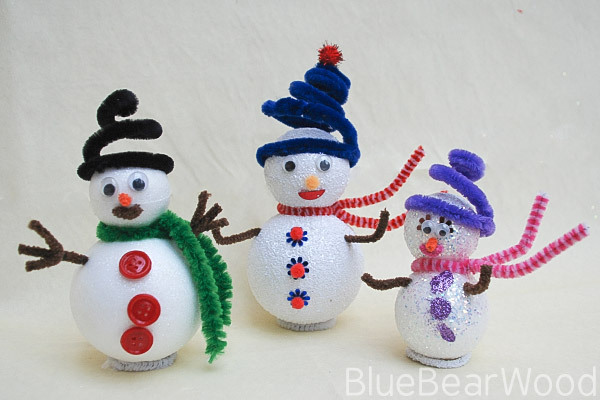 These are great snowmen. Very crafty for a cold winter weekend with the kids. I’m a new follower from MBC. Soo cute!! 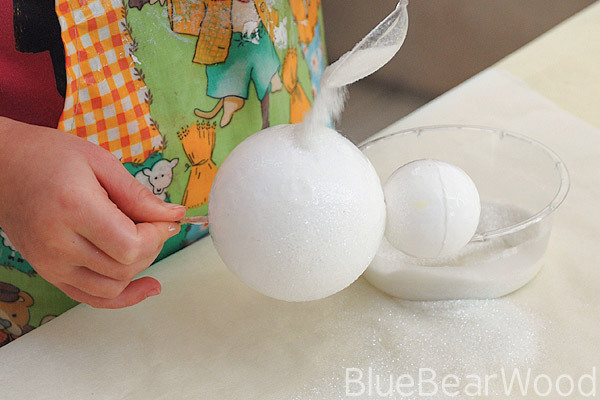 My son and are want to make some! Thank you for the post. Oh they are so cute! 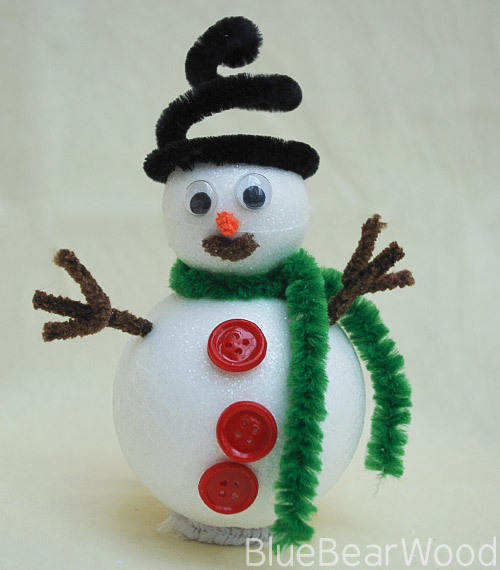 My husband has a thing for snowmen so might have to get him on the case to make these with the kiddies. 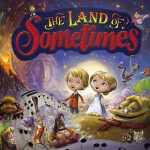 thanks for linking to fun sparks! I love these. Will make next Christmas. 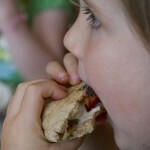 Also it’s really lovely to see your kids’ dear little fingers in the pictures. Oh snap! Yours look so much cuter than ours, I love their little hats! 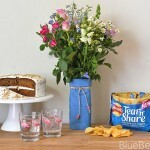 We will defintely be having another go at these following your instructions – perfect! 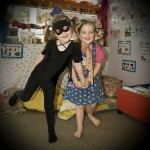 Thanks for linking to Festive Friday! I so love their hats and scarves.